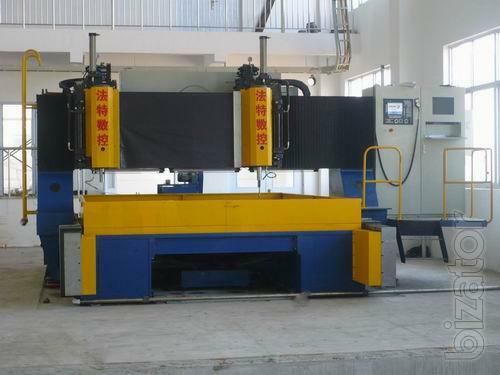 This machine is designed through the feature of heat inverter unit, it can finish drilling the hole of tubesheet, hole of bolt and drilling of sheet, also it can be used for handling of joint plate of steel construction and products etc. It has the system of clamp, automatic removal and refrigeration circulation. It has to to four power heads which makes it work high efficiently. Advanced CNC power head feed-in system. All kinds of safe monitor and alarm stop system: The machine will stop if the drill breaks or other contingency happens, in order to avoid mechanical failure. Easy operation, lower the possibility of misoperation and the affect of human factor to the quality of the machine. Realizing CAD/CAM(can be operated once the interrelated file is folded. We welcome any inquiry or questions to us at any time, and welcome to visit our factory to see the machinery working, also we can receive the orders according to your requirements.